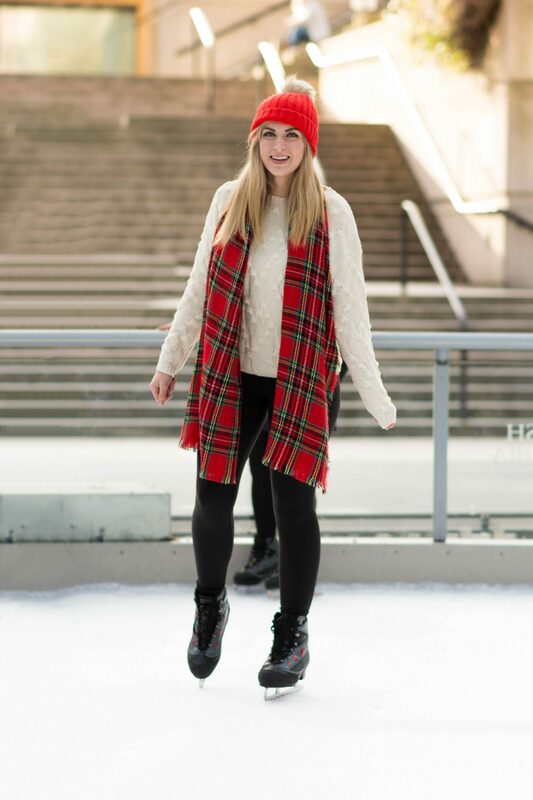 I wore this fun outfit to go skating at Robson Square rink last weekend. While sharing the outfit in my instastories; I asked my followers whether they’d be interested in seeing not just this outfit but a post on things to do when it rains in Vancouver this winter. The answer was over 90% yes! So today, let’s chat about this cozy winter outfit that I’m obsessed with and my list of things to do when it rains in Vancouver this winter. I’ve worn this outfit a ton this winter for outdoor winter outings. 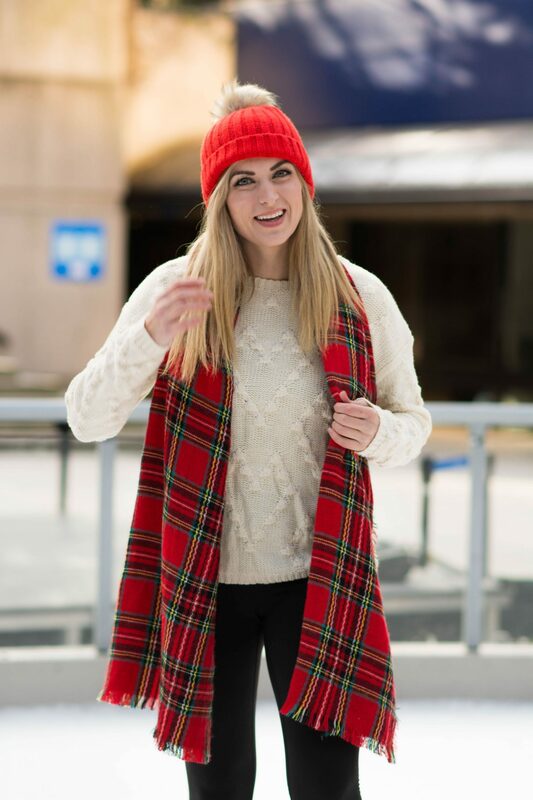 The heart pom sweater is adorable (and under $30) and it’s so easy to style with any combination of toque/beanie and scarf. My pom beanie comes in 7 colors; I also have the dark green. I like it because the faux fur pom contrasts the knit color (I’ve seen so many beanies with matching color knit and faux fur pom, but I prefer this contrasting look). My exact scarf is sold out, but I’ve linked up a similar red plaid one if you are interested. Final part of the outfit I have to mention – my leggings! These are the Zella leggings, and they are by far the best leggings I’ve found in terms of comfort and staying in place/being slimming. These are a major win, and worth every penny. Alright, let’s chat Raincouver, shall we? You know I love this city. Love, love, love. But believe me when I say that by day 40 of straight rain during the winter love is certainly not the word I would use to describe my feelings towards this damn rain forest climate. 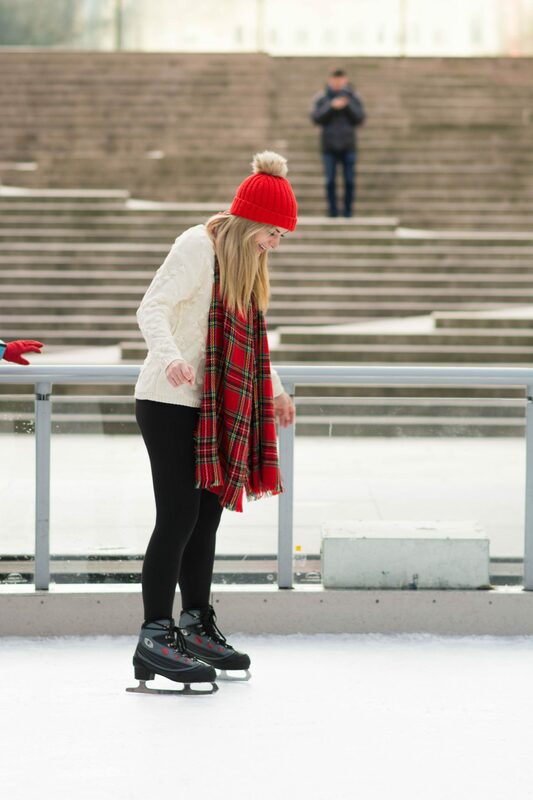 Open until February 28, 2019 Robson Square skating rink is a Vancouver staple, and a must-do activity even in the rain. The rink has the benefit of being outdoors, but with a rough cover you can skate and stay out of the rain. For more info on hours, etc: Robson Square Rink. Farmer’s Markets are often thought of as a summer activity, but there is a fantastic winter farmer’s market with 70+ local vendors selling their winter produce and homemade goods. For more info: Vancouver Farmer’s Market. Dine Out Vancouver – an event done in many cities now where many incredible restuarants offer multi-course dinners at $20, $30 or $40 – is on in Vancouver from now until February 3, 2019. More info at Dine Out Vancouver. With a significant portion of the market being indoors, this is a great thing to do on a rainy day. Pick up some snacks, explore, and settle down for a drink or bite to eat after looking out over the water. For more info see: The Granville Island Public Market website. Science World … or the science bubble as I incorrectly called it for the first three years I lived here … isn’t just for kids. They’ve got adult exhibits like “The Science of Cocktails” as well as, my favorite, “Science World After Dark” – which is every other Thursday night from 6:30 – 10:30. You can explore cool science exhibits while having a drink or two. Info on the Science World website. The Vancouver Art Gallery is one of the cities most recognizable (and beautiful) buildings. On a rainy day, head in and check out what’s new! Times, prices, etc., on the Vancouver Art Gallery website. One of the few perks of living in a city that rains 5 months of the year is the sheer volume of cute and cozy cafes that pop up because of it. On a rainy day head to any local cafe and just enjoy. Stay tuned for a post on my favorite cafes in Vancouver! For now, I’ll just say two of my favorites are Olive & Ruby and Faubourg. Nothing says Vancouver quite like a yoga class on a rainy day lol. If you are visiting Vancouver, I’d highly recommend taking a class at Semperviva on Granville Island since in addition to a good yoga class you’ll be having your class in a studio overlooking the Ocean. It’s so pretty to look out at this view in the rain. The ultimate Vancouver experience! MacLeod’s is a definitely an experience. There are more books in this tiny space that seems physically possible, but they make it work. MacLeod’s is a Vancouver landmark; having been here for over 50 years. It has been called “Canada’s Last Great Bookshop”. They don’t have a website (somehow that makes it even better, right?) so just head there during opening hours- 10 – 6, 7 days a week. That’s it for now! I hope you found this list of things to do when it rains in Vancouver helpful. "Winter Trend Alert – Layered Coats"
Finding things to do in crummy winter weather is so important, otherwise I’d probably never want to leave my couch! The skating rink sounds so fun! These photos are previous gal! Love your look! Great idea to go ice skating too. I love this outfit… that sweater is so cute! These are also all such great indoor ideas. I haven’t gone ice skating in so long! These sounds like such fun rainy day activities! Love your scarf! Aaaand now I want to visit Vancouver, just to enjoy it in the winter 😉 These ideas sound like so much fun! oh I want to visit Vancouver now! It looks like a fun ice skating rink, and I love winter. Science world sounds like so much fun! I always love a good museum, especially when it’s cold out! It’s so cool! I love that they change their exhibits all the time and focus on having stuff just for kids and just for adults. Thanks girl, it’s probably my favorite winter accessory! And haha yasss come visit! Right??! Ugh!! I’m over the rain, but at least love having a list of good things to do to fall back on.